Supernovae are rare in occurrence, but at the center of an enigmatic nebula lie two stars that astronomers say will eventually end in a fiery, violent supernova. Astronomers believe that the two stars are set in such a tight orbit that they will merge and cause each other’s explosion and death. Using the European Southern Observatory’s (ESO) facilities in combination with telescopes in the Canary Islands astronomers have identified these two massive stars at the heart of the planetary nebula Henize 2-428. As they orbit each other, the two stars are expected to slowly get closer and closer, and when they merge, about 700 million years from now, they will contain enough material to ignite a vast supernova explosion. These white dwarf stars — tiny, extremely dense stellar remnants — have a total mass of about 1.8 times that of the Sun. This is the most massive such pair yet found. “Further observations made with telescopes in the Canary Islands allowed us to determine the orbit of the two stars and deduce both the masses of the two stars and their separation. This was when the biggest surprise was revealed,” said Romano Corradi, a researcher at the Instituto de Astrofísica de Canarias (Tenerife, IAC), and co-author of a paper published in the journal Nature on Monday. Not only have astronomers now explained why this particular nebula has a weird shape, they’ve also uncovered a gravitational wave factory — energy is gradually being lost as both stars rip around one another, causing their orbital distance to decrease. 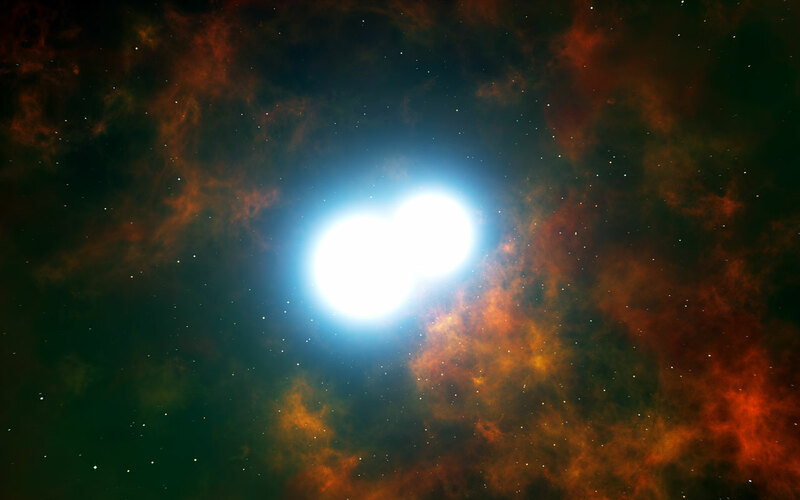 But what will happen when both stars collide and merge? The two stars are sufficiently close to one another that, according to the Einstein’s theory of general relativity, they will grow closer and closer, spiraling in due to the emission of gravitational waves, before eventually merging into a single star. The resulting star will be so massive that nothing can then prevent it from collapsing in on itself and subsequently exploding as a supernova. “Until now, the formation of supernovae Type Ia by the merging of two white dwarfs was purely theoretical. The pair of stars in Henize 2-428 is the real thing,” said co-author Dr David Jones from the Instituto de Astrofisica de Canarias and the Universidad de La Laguna, Tenerife, Spain.